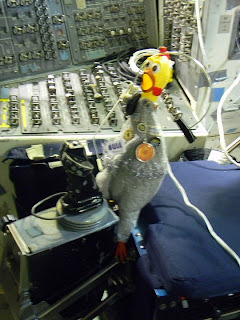 No, this is not how I will be flying to NASA Goddard Space Flight Center this weekend! But this is me in the pilot seat of the Orbiter Trainer. The Shuttle pilot sits on the right, while the Commander is on the left side. One way for pilots to practice flying the Orbiter is in the simulator. But there is nothing like really flying. 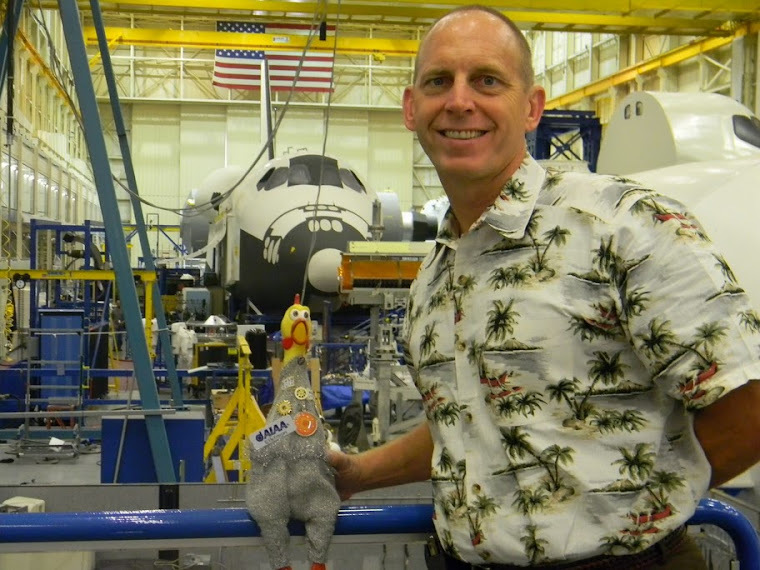 So NASA has the Shuttle Training Aircraft (STA). It is a training vehicle that duplicates the Space Shuttle's approach profile and handling qualities, allowing Space Shuttle pilots to simulate Shuttle landings under controlled conditions before attempting the task on board the actual orbiter. A sophisticated computer system installed on board the STA simulates the flight dynamics of the orbiter with nearly perfect accuracy. The STA's highly realistic simulation of the Orbiter is not limited to handling characteristics, but also implements the shuttle control interfaces for the pilot. The orbiter is no glider at all. In fact, it is referred to as "The Flying Brick". See, the orbiter lacks the atmospheric engines that would allow it to just abandon a landing approach, go around, and try another approach. It truly is a "one-shot-deal". After the orbiter re-enters our atmosphere it is a very heavy "glider" with not a lot of lift. So pilots use the STA to practice the orbiters behavior in flight. At 37,000 feet (11,300 m) the main landing gear is lowered (the nose gear stays retracted due to wind load constraints) and the STA engine thrust is reversed. Its flaps may deflect upwards to decrease lift as well as downwards to increase lift. While flying the STA in simulation mode, the STA never touches down on the runway. If the pilot has done everything correct to the point where the pilot's eyes are 32 feet (or 10 meters) above the runway, a green light turns on, indicating the orbiter has landed. When that light comes on, that would be the exact position that the pilot's head would be during the actual landing of the orbiter. But the STA is still about 20 feet (or 6 meters) above ground. I have not yet met a Shuttle pilot but that's on my list for the next two weeks. I'd love to hear more about their experiences with the STA and then actually flying the orbiter. I also heard that there is a competition to get the nose wheel right on the center line... bragging rights, I think!